In the West, woodblock printmaking employs oil-based ink applied over a design using a roller. The design is transferred onto the paper often with the aid of a press. In the Japanese tradition, a brush is used to apply water-based ink on the woodblock design and using the hands, is then pressed deeply into the absorbent paper. The Japanese technique was called ukiyo-e. It was assumed that it was during the 8th century that the art of woodblock printmaking came to Japan from China. The two countries were very much engaged in cultural exchange at that time, therefore the assumption seemed valid. Historians assumed that the Chinese acted as consultants when, in 770, Empress Shotoku ordered some of the first known text prints of Buddhist verses, called “dharani.” Small wooden pagodas were used as the storage of each of these verses. However, there was no proof found as to where the plates used to create these verses came from. At the early stage of woodblock printmaking, the only place these were done were in the Buddhist monasteries, since most of them were for the reproduction of Buddhist images and texts. Later, woodblock printmaking was also used for the production of books. Private studios started the art only in the 17th century, creating black and white prints. Japanese woodblock printmaking reached its prime in 1603 up to 1868, which is the Edo period. The new shogun then was Tokugawa Ieyasu and Edo, which used to be a fisher village (now known as Tokyo) was named as the country’s new capital as this was where Ieyasu established his headquarters. The growing capital attracted plenty of salesmen and craft artists. The rich middle class focused on culture because they were restricted from politics, which gave rise to many forms of leisure, such as brothels, sumo wrestling and theater. Artists then were free to portray the images of this new time, which was called “ukiyo-e” or the images of the floating world. 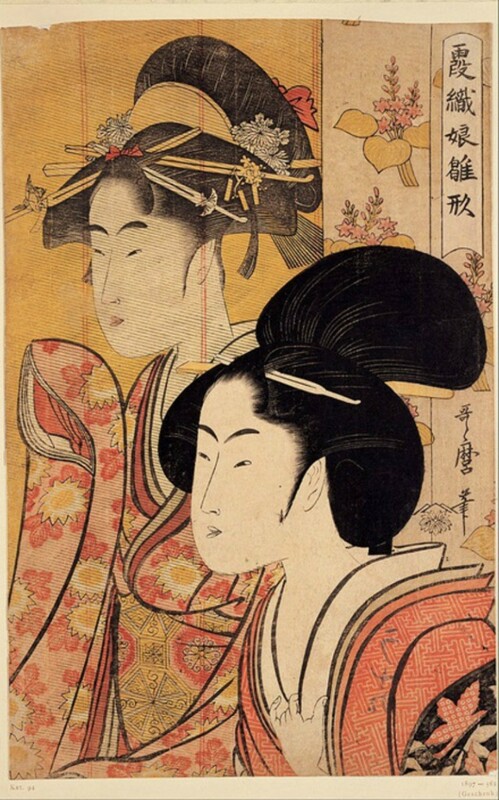 One of the very first artists who created prints in this genre was Moronobu. That was in the 17th century. He created single sheets of reasonably priced prints, which became very popular around Edo. The first prints, which were in black and white were called “sumizuri-e.” Later colors were applied by hand to the woodblock prints (sumizuri-hissai). With the popularity and high demand for the prints, the number of colors used increased, and metal dust was added. By the early part of the 18th century, the Japanese printers were printing them using two or three wood plates. It was during this time that the registration marks or the “kento” was invented, which allowed for the printer to use many plates and still achieve high accuracy in registration. One artist who excelled in this was Harunobu, who was able to design prints using over 20 plates. Prints like this were called “nishiki-e” or brocade prints. Ukiyo-e prints employed several themes. When it was starting, folk legends and images from the kabuki theater were the popular themes. Harunobu had several designs showing scenes from everyday life in Edo. Artist Utamaro was sought after for his very fine portraits of beautiful Japanese women. Ukiyo-e masters Hiroshige and Hokusai were known by the end of the 18th century for their animal and landscape themes. Japanese harbors were forced to open by American ships in 1853, which marked the beginning of social changes in Japan. The shogun was forced to resign and Emperor Meiji was enthroned in 1868. His reign lasted until 1912. Japan started to open to Western culture, which received strong government support. 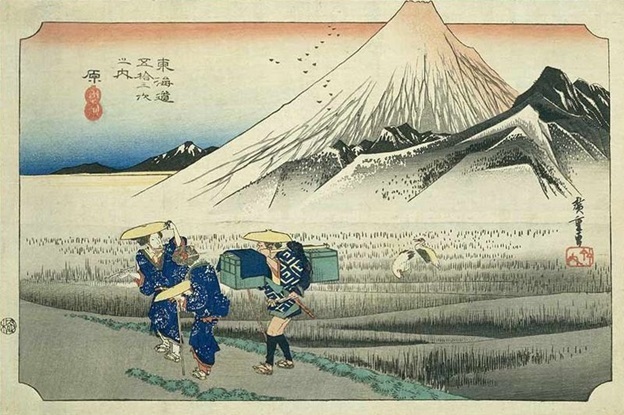 Although Western printing techniques were introduced in Japan and practically swallowed the traditional method of ukiyo-e, the traditional designs reached Europe. Ukiyo-e made a huge impact there and for a time strongly influenced the art movements such as the new poster movement and the Jugendstil (Art Nouveau), especially in decorative arts. Likewise, ukiyo-e caught the eyes of several artists, including early Impressionist such as Monet, Manet, Degas and Post-Impressionist painters like Gauguin, van Gogh and Toulouse-Lautrec, who was an Art Nouveau artist. In the 1870s, Japonism even became a very prominent trend in Europe. Meanwhile, Japanese artists who came back from their European studies were influenced by the Western printmaking techniques, which gave birth to the creative print or “sosaku hanga” movement. While these artists designed prints showing modern expressions and abstract images, another movement, the new print or “shin hanga” movement was started by publishers such as Watanabe, who wanted to keep the traditional woodblock print techniques alive.